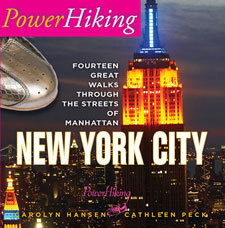 Add to the excitement and enjoyment of Super Bowl 2014 in New York with PowerHiking New York City, Fourteen Great Walks Through The Streets Of Manhattan. 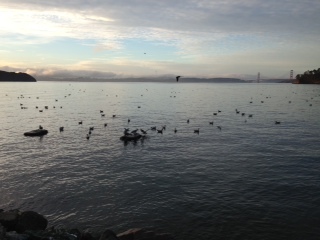 The herring continue to run on San Francisco Bay and the birds and seals continue happily chasing after them. But the fog has come in and you can hear the birds but not see them. 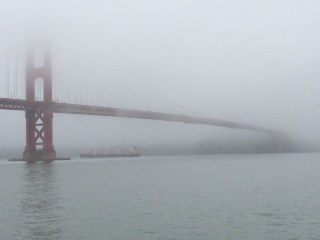 What a different perspective of the Golden Gate Bridge when it is shrouded in fog. 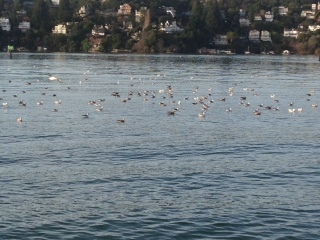 The Herring are running in San Francisco Bay and the birds are aware. The waters are filled with birds – sea gulls, pelicans, ducks and geese – floating in the water everywhere and even close to the shore. With a sprinkling of fog over the City and a few clouds dotting the sky, the Golden Gate Bridge looks down on the feeding frenzy. The water is placid and calm as the birds feed and seals frolic and feed among them. Even a porpoise comes up for air near the rocky shore. Ferry boats ply back and forth and the occasional power boat passes, but the birds are not deterred. You are currently browsing the Powerhiking's Blog blog archives for January, 2014.